Greetings crafty friends. LeeAnn here today with a little Father's Day Inspiration using the Father's Day set from Joy Clair. The card base is 4.25" x 5.5", the black later is 4" x 5.25" and the top layer is 3.75" x 5". Using Warm Sand color Powderpuff Chalking ink I created the sand trap. I then covered it with post-it tape. I then used Jade and Seafoam Powderpuff Chalking inks to create the green. Once this was dry (doesn't take these inks long) I used Versafine Onyx Black to stamp the imaged sentiment in the upper right corner. Once I was sure the sentiment was dry, I used double sided tear tape to adhere all the panels together and my project was complete. 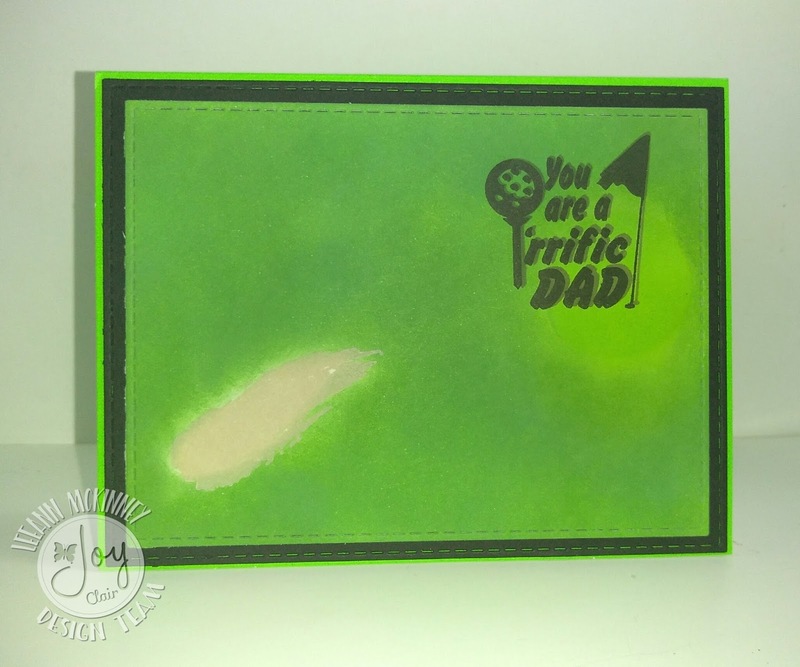 Great card for any golfing Dad! Great card and great design!! Love it - perfect for the golfer! LeeAnn, what a clever idea to make the background of your card to look like a golf course. The grass looks so real.